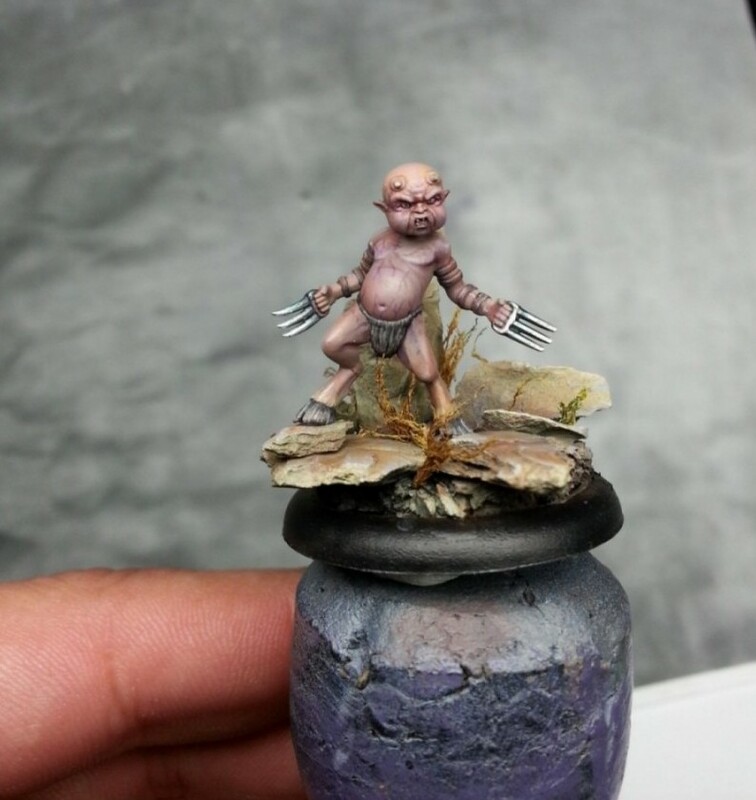 Last week I wrote about painting the skin on my Malifaux Terror tot, and today I will write a few more words about the miniature. 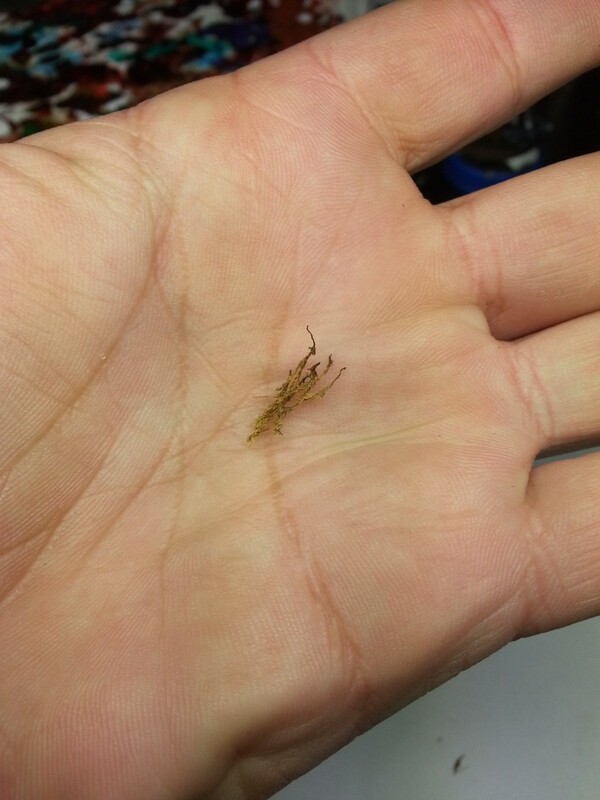 At the moment I call him (or her?) done for gaming, there is stilla few point I would like to adjust, but at the same time I want to continue painting the rest of the crew (aamong many things). So I will try to summarize ther rest of the painting in this post. When I last wrote about the Terror tot, it looked like this. From that point on I continued to work on the skin, added a few more glazes of purple/white, pure purple some dark blue and green. 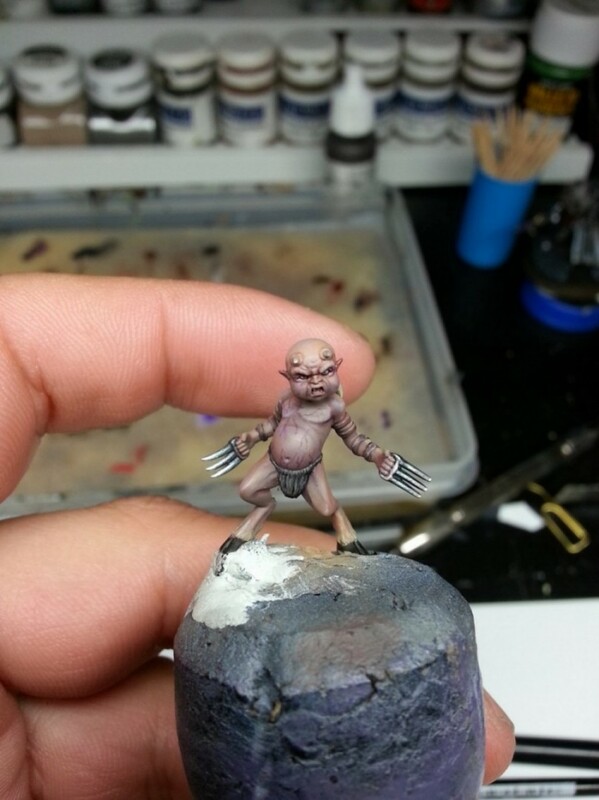 I didn´t do that on the whole miniature since I wanted to add some shiftings in the skin. The veins and stretch marks on the skin was done using the Dark blue color very dilluted and then a dark red. When the veins was compleatly dry i glazed over them using the mix of purple and white to make them blend in with the skin. On the head and upper parts of the legs i did some dots using just purple ink wich I diluted. For the claws I went for TMM, starting of with a very dark metallic (almost black) using a mix of black and silver from Vallejo air. I then highlighted the claws adding more and more silver to the mix. I finished them of by shading them down a bit using Dark blue glaze followed by a glaze of Hawk turqouise (man, it´s hard taking pictures of metal!). 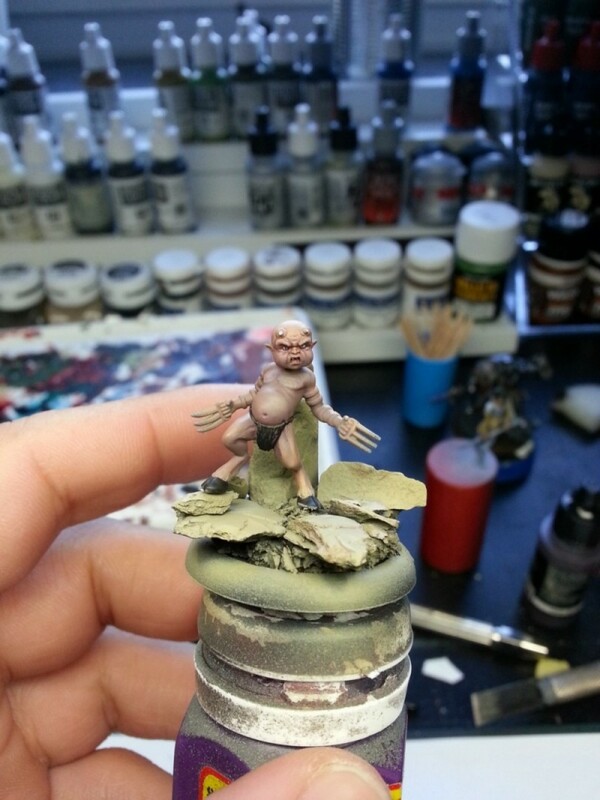 To finish of the base I used a mix of organge, dark brow/grey dry pigments and some blue and green glazes. I tried to do them pretty much randomly since earth doesn´t looks organized. 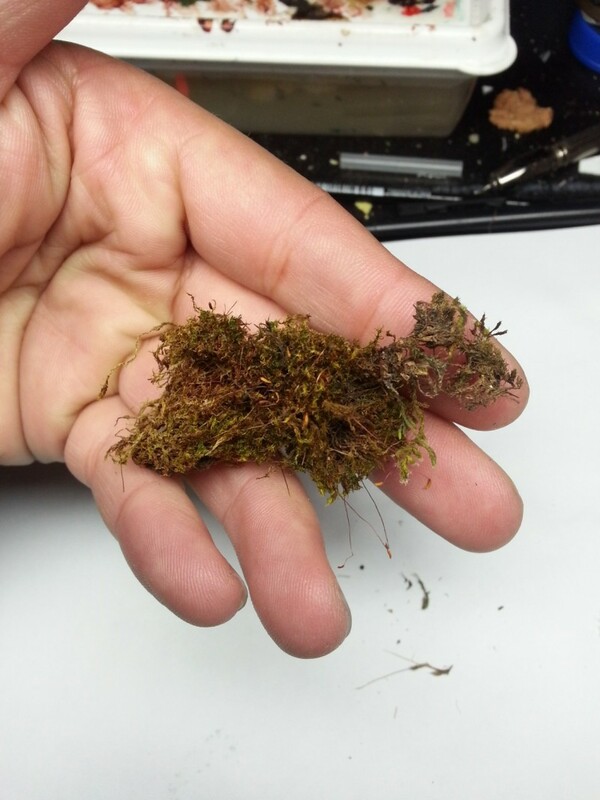 The finishing touches on the base was to add some real plants, using dried moss wich I “glued” to the base using Matte varnish from Vallejo. 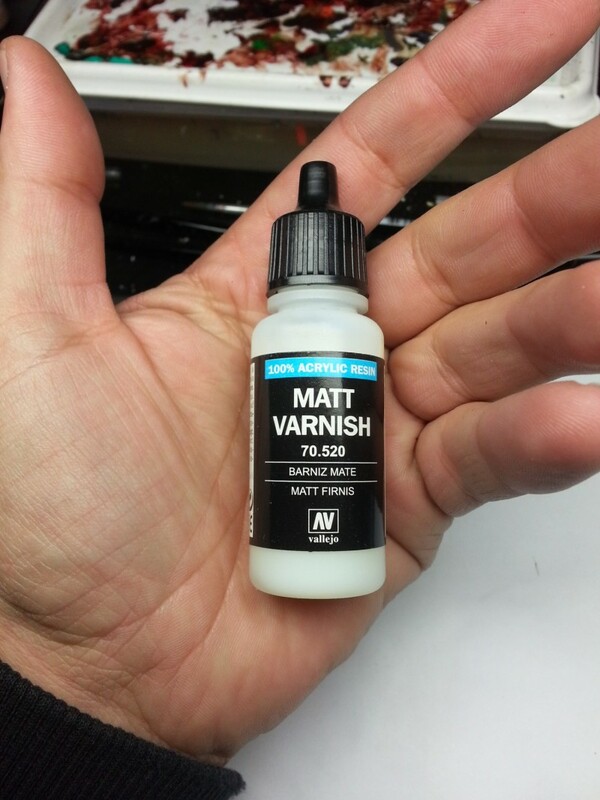 Matte varnish dries compleatly matte comparing to superglue wich leaves a glossy surface. 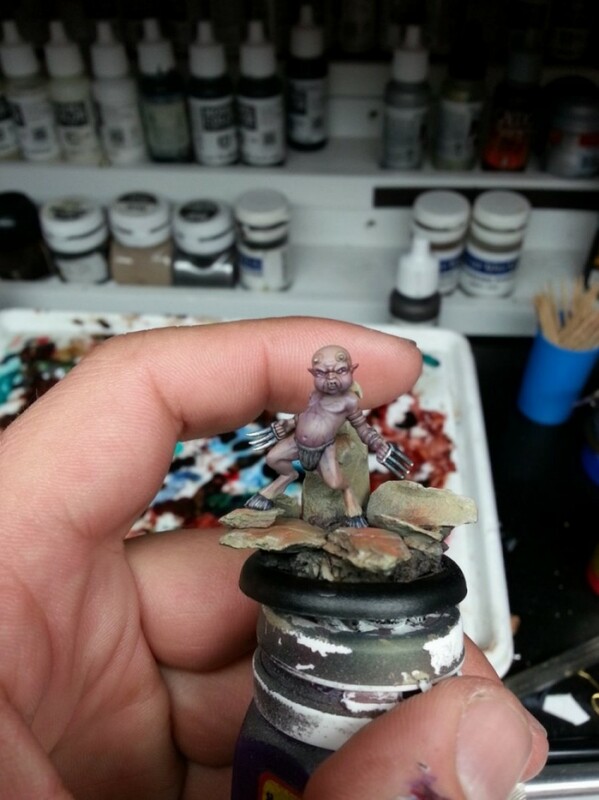 Still the miniature needs to be handle with care after using Matte varnish since it´s not a hard as superglue. And here is a picture of the finished Terror tot, taken with my cellphone (you have to forgive me for that at the moment, I´ll take better pictures as soon as I can). May I ask for how many years you are painting so far? Well, I first fiind out about painting miniatures somewhere around -95 and painted for a few years. Then I had a break for several years (family stuff came beween) and then I rediscovered painting a few years ago. But it´s the last twwo years where my biggest improvement have been. Before that I was mainly aiming for a well painted army.